ShadowLight Teaching Artists are professional artists trained in the art of shadow theatre and have worked as ensemble members in ShadowLight’s large-scale productions. With masterful improvisational skills and tremendous enthusiasm, these individuals create a dynamic environment that fosters creativity and a sense of community within the classroom. The teaching artist team also participates in on-going professional development throughout the year to further enhance their skills and provide high quality shadow theatre activities. Leonidas Kassapides (kassapides.com) is a native of Thessaloniki Greece and has been performing and teaching Traditional Greek Shadow Theater and modern shadow theater in the United States and Europe since 1989. He has a BA in Theatre Arts from Berea College Kentucky (with an emphasis on education). He has been teaching shadow theater at elementary and middle schools in the SF Bay Area since the early 1990s. As a core company member of ShadowLight Productions, Kassapides has performed in In Xanadu, The Wild Party, Coyote’s Journey, Seven Visions, Monkey King at Spider Cave and Ghost of the River. He was also the shadow artist for Lou Harisson’s opera Rapunzel at the Cabrillo Music Festival in 2001 and has performed in puppetry festivals in San Francisco, New York, Seattle, Minneapolis and Savannah, GA.
Lydia Greer (lydiagreer.com) is an award-winning Arts Educator with fifteen years of experience. Lydia Greer has taught visual art, animation, film and film history/visual studies for over fifteen years on the West Coast and lives and works in the East San Francisco Bay Area, California. Lydia is a visual artist whose layered, mixed media work includes sculptural and video installation, hand-made stop-motion animation, single and multiple channel video, shadow and puppet theatre, and works with paper. Her multimedia/mixed media artwork and extended cinema performance work has been exhibited internationally and nationally most recently with commissions from The Exploratorium Museum (SF), Mamuta Art & Media Center (Jerusalem), Monkey Town (Brooklyn), Skowhegan School (NYC), Shapeshifter’s Cinema (Oakland), Other Cinema at ATA (San Francisco), Berkeley Art Museum and Pacific Film Archive (Berkeley), Royal NoneSuch Gallery (Oakland), Cabin Gallery (Chicago), Berkeley Center for New Media (Berkeley), Radar Productions (San Francisco), Museum of Human Achievement (Austin), ProArts (Oakland) and inclusion in The Channel of Democracy: Womanhood, Power & Freedom in Video Art, an all-women video art exhibition at the International SF PhotoFairs 2018 at Fort Mason Center for Arts and Culture (San Francisco). Caryl Kientz is a writer, performer, theater practitioner, and visual artist living in Oakland CA. Her practice includes performance, installations, puppetry, art direction and props for film. A focus on illusory environments, integrating art and performance into daily routines has led her to experiment extensively and collaborate with a diverse number of groups. Caryl has been working primarily with ShadowLight Productions in San Francisco since 2008 on multiple productions as ensemble member, assistant director, shadow theater designer and consultant. Her show credits are Ghosts of the River, The-Good-For-Nothing-Lover, The Magic Flute (Ballet Austin), Jana & Baladoor (dir. Bahram Beyzaie), Poro Oyna, Poison Fish shadow scenes for the documentary film, Finding Kukan (dir. Robin Lung) and ensemble in Feathers of Fire (dir. Hamid Rahmanian). She has also worked with ShadowLight creating art installations, films, teaching workshops and classes for adults and children in museums, arts organizations and schools. Caryl teaches shadow theater technique and design for K12 students in Bay Area schools. She encourages students to be imaginative and to collaborate. It is important that her students see themselves as part of an ensemble working together to tell a story. She received a BA in Rhetoric with a focus in Narrative and Image from UC Berkeley in 2014. 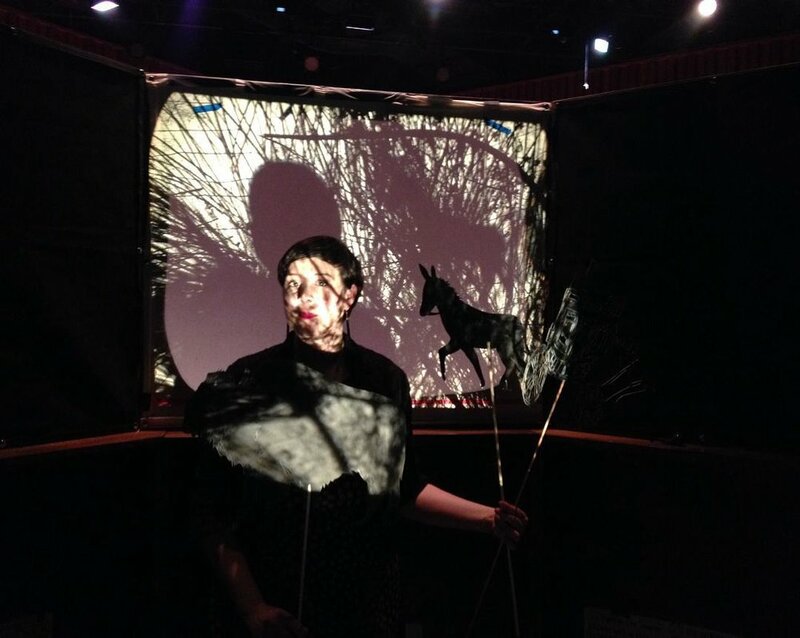 In January 2016, she joined the Facing West Shadow Opera (art dir., Lydia Greer) to direct a shadow puppetry performance collaboration with live opera singers and projected stop motion animation. I Made Moja is a prominent Balinese visual artist with a background in traditional ink and watercolor painting. His work has been shown internationally and featured in numerous books on Balinese art and culture. Since relocating to the Bay Area, Moja has been creating puppets, designing sets, and performing with ShadowLight Productions since the early 90’s. He is also a primary dancer with Gamelan Sekar Jaya.